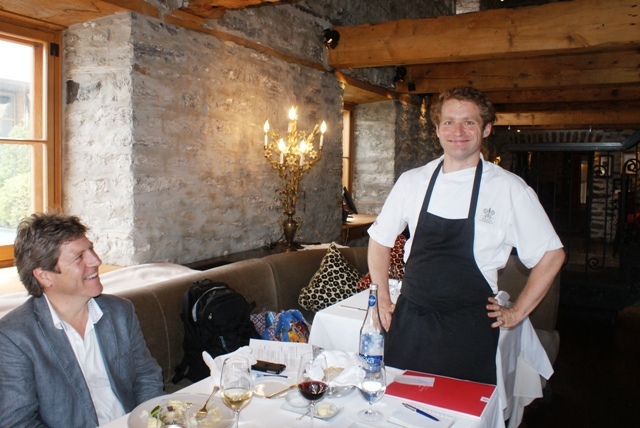 “To make a short story long” to quote Robert Lancup, (see below for who he), here is the tale of a few of the many unforgettable dining experiences I had during my stay in Québec City, one North America’s, oldest towns. Food is at the heart of this very French part of Canada and the cuisine is an intriguing mix of Continental and Canadian, with freshness and creativity the key to its increasing popularity and success. 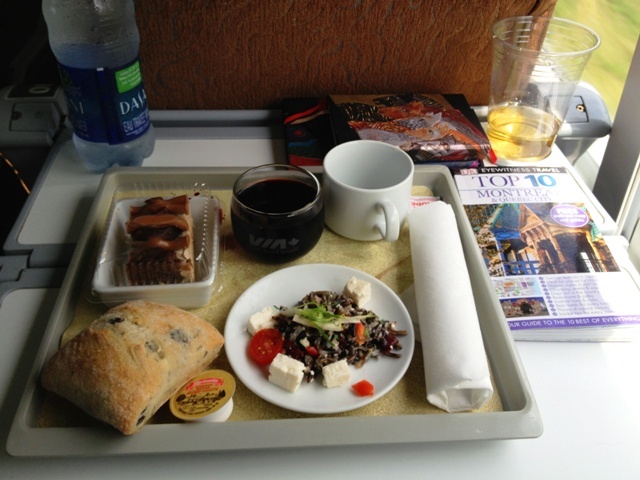 I’d travelled from Montreal on a Via Rail train and even that journey had been a foodie revelation. Admittedly I was in first class (thank you Québec Region Tourism) but even so, having been used to the very mediocre food served on my regional Virgin Trains, the meal was much better than expected. Beef in Black Bean Sauce and rice with salad and olive bread followed by a light chocolate mousse finished off with good coffee AND a chocolate truffle, all served with friendly cheer. Perfect. I checked into the quirkily elegant Auberge Place D’Armes, ideally placed high above this historic city overlooking St Lawrence River. My room had an eclectic mix of French style with a deliciously decadent shower and precarious wrought-iron balcony overlooking the old square and gloriously OTT Chateau Frontenac. 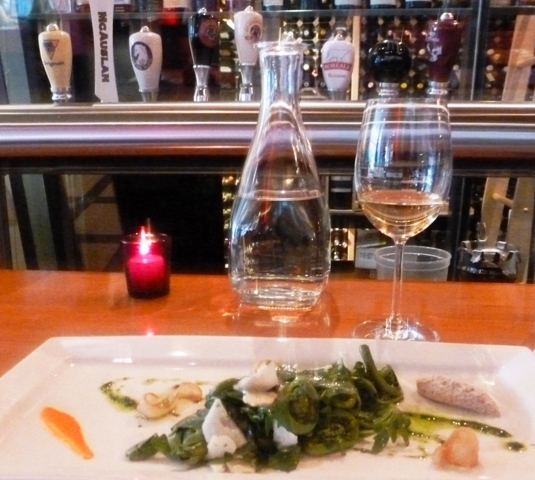 After a quick change I was off for the first of my ‘eating out in Quebec City’ adventures to the uber-cool Le Cercle, much more than just a restaurant in downtown Québec. It’s a combination of friendly bar, trendy diner, jazzy night-club and theatre. 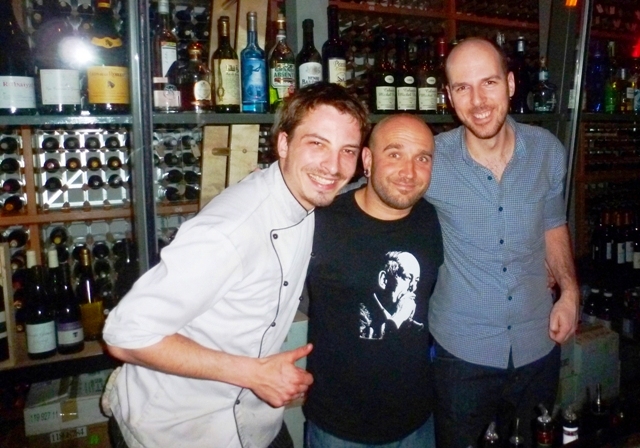 I was extremely well-looked after by a trio of charming guys – owner Fréderic, Guillaume the Sommelier and chef Emile who introduced me to the delights of beef tartare with basil and mustard piri piri, and fiddlehead salad – baby furled fern fronds delicately steamed with cauliflower, rocket, almond puree lardons and red pepper emulsion. Loved the colour and crunch of the ferns. Further taste surprises included delicate pan-fried scallops in razor clam sauce and salted cod with rhubarb. Th emain course of juicy lamb flank with braised fenugreek, celeriac and artichokes with shitake mushrooms was substantial without being overpowering. When I tell you that I couldn’t eat another morsel til presented with white chocolate and blackcurrant sorbet, hazelnut cake and praline crumble – you may understand just how tempting and tantalising this food was. Chef Emile enthused about cooking and his passion for using local ingredients, explaining that much of their produce comes from their 1.5 acres of vegetables grown nearby. His food would stand very favourable comparison with many top-class restaurants around the world. 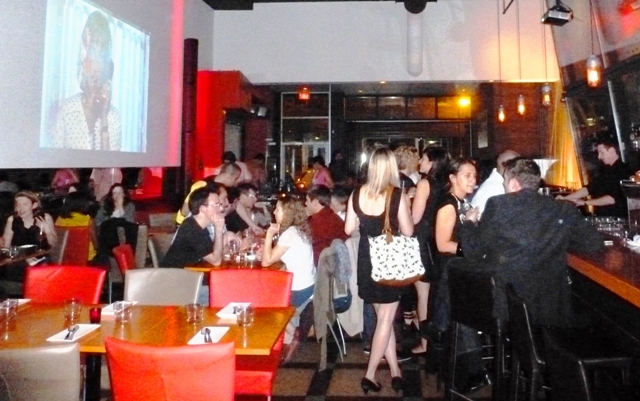 Throughout the meal the bar got busier and more lively. An eclectic mix of jazz, motown, blues and rock LPs were being played by the DJ and above the diners a huge wall of video montages flickered. People were sitting outside as the city celebrated the beginning of summertime. Fred, as he likes to be called, showed me round, explaining his philosophy of showcasing a â€creative edge of film, song, art and theatre served up with good food and drink in a friendly, dynamic, atmosphere.â€ Before I left he wished me to “have a very good experience in Quebec”. If this evening was anything to go by, there was no doubt about that though I wasn’t sure I would survive the extraordinary foodie fest. 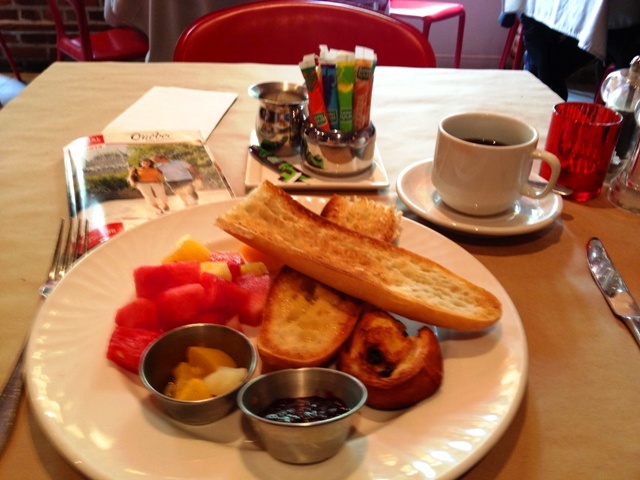 After a VERY light breakfast of fresh fruit at Auberge Place D’Armes , crusty baguette and home-made fruit compote at my auberge, I was ready for my next adventure. This was a really excellent guided tour around old Quebec City, Montmorency Falls and other-worldly Ile D’Orleans. That’s for another time. My lovely guide, Caroline dropped me off on the reclaimed waterfront at the extremely elegant Auberge Saint-Antoine, where I was to have lunch with charming Ingrid Lemm from the hotel and Robert Lancup from Quebec Region Tourism. The buildings date back hundreds of years and it manages to combine elegant sophistication with historic character. We ate in the aptly named Panache restaurant, (though apparently Panache means Antler in this case) which managed to be intimate and welcoming within the high wooden ceiling and stone walls of a 19th century riverside warehouse. And once more I was taken on a gastronomic journey of unusual tastes, visual delight and creative imagining. The quirkiest dish was the ‘starter’ which consisted of three bulrushes stripped down and artfully arranged on a slab of slate. This was promptly followed by a briny fresh oyster surrounded by tiny fir cones and young sprouts. The next course had us all searching our smart phones for the name of the dainty white-flowered plant decorating the plate. 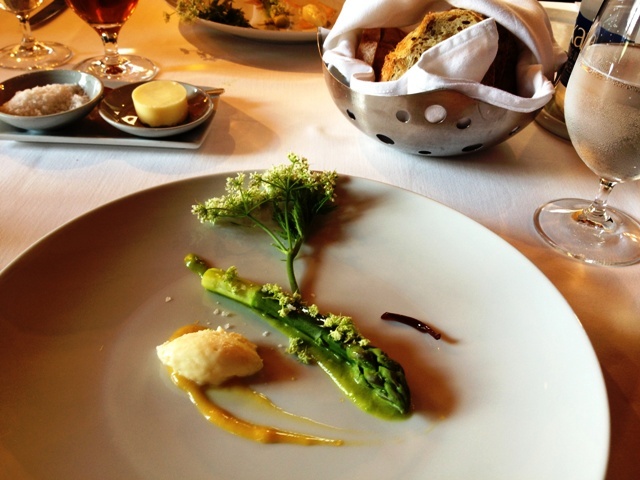 It turned out to be sweet cicely served with asparagus, cream cheese and wild ginger. 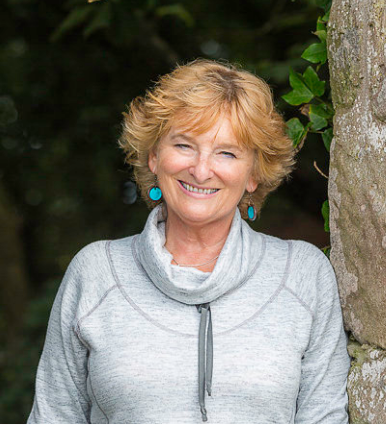 Next came a sorbet of tree moss, lichen and oxyalis with a morelle mousse – I think. My notes were getting a bit scrabbled by this time on account of the excellent wines we were trying with each course and total unexpectedness of every dish! And more was to come! Macaroni stuffed with cream and olives, topped with roasted pepper and parmesan foam beside sauteed veal in a red wine sauce and young carrots. 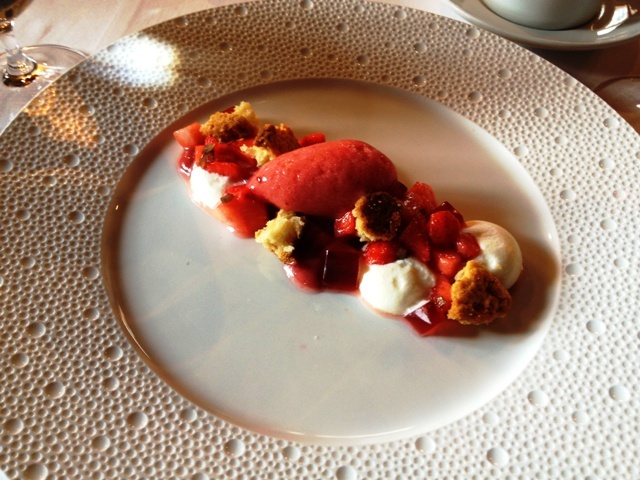 Then for dessert – oh yes, dear reader, there was more – teeny strawberries and creme fraiche, wild ginger, scone crumble and ginger jelly. As I was attempting to do justice to this extraordinary food, Panache chef, Julien Dumas, joined us to talk about his philosophy of fine dining. Trained with international master chef Alain Ducasse, he has developed his own signature style of cooking, foraging for unusual ingredients in the surrounding countryside and making the most of locally-grown seasonal food, often from their kitchen ‘garden’ on the Ile D’Orleans. 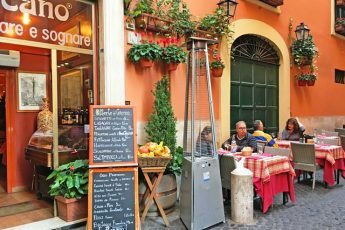 I finally had to leave this convivial company and superb restaurant as later that afternoon I was booked to go on a City Food Tour and I needed a lie down.. Yes, the phrase ‘glutton for punishment’ is very appropriate here. Eating out in Quebec City never stops! But I will save that gastronomic adventure for another time as I suspect you also may have had your fill for now. Many thanks to Quebec Tourism and Canada – Keep Exploring for a flavour of the culinary treasures of this fascinating city. A grand mercie beaucoup also to the Auberge Place D’Armes for a really pleasurable stay and also to the Le Cercle and Auberge Saint Antoine for such delicious and unforgettable meals; that French Canadian fusion is truly magnifique. 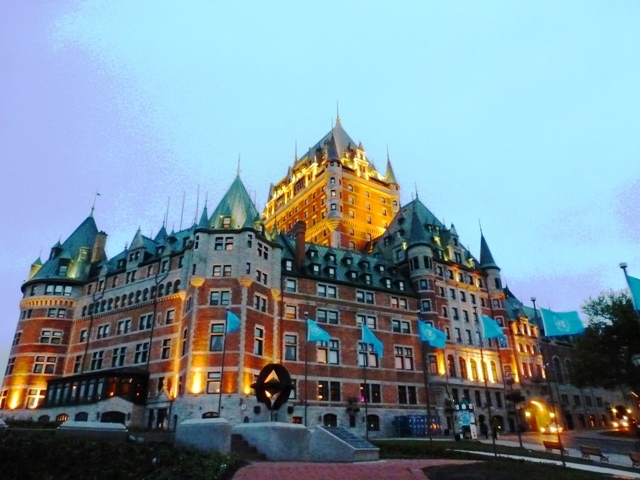 Check out Quebec Region for more information on this area of Canada. Made me feel quite jealous (and hungry) ….. must be overdue a return visit to the fair city of Quebec! Canada is into my wishlist. I’ll add Quebec City as you suggest! Silvia sure you won’t regret it. I think it’s quite simply one of the most attractive and interesting cities I’ve visited. 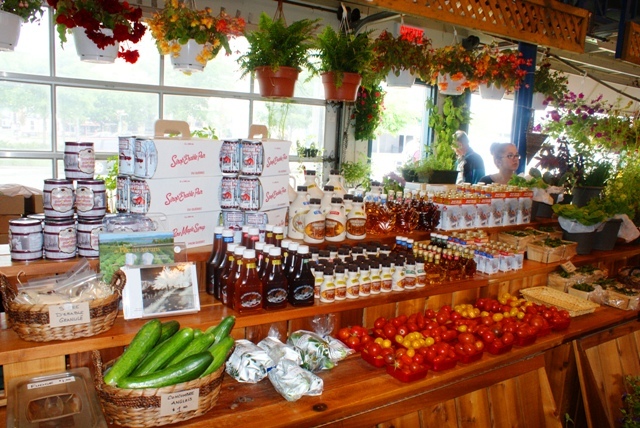 We recall well all the great food when we visited Quebec City a few years ago – one of Canada’s loveliest cities!